So, I play a little World of Warcraft from time to time. I run around with my little dude and kill things and stuff. Some of that stuff involves selling virtual items for virtual gold on the “auction house”. 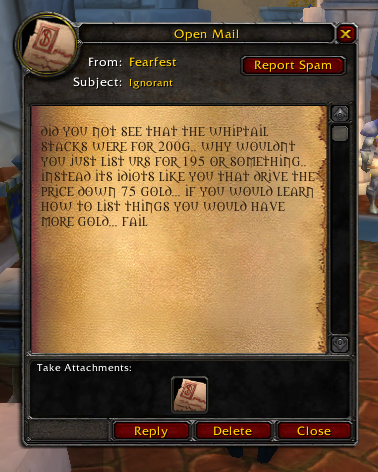 Much to my surprise, (and delight), I was sent this gem of an in-game email from another player scolding me for not selling my virtual herb, “whiptail”, for enough virtual gold. FAIL! Want More Auction House,Correspondence,Nerd Central? Fearfest diligently researches current market values to provide goods that are both fairly priced and profitable. He didn’t minor in business for nothing. I’m going to report you to the Better Business Bureau. ha ha ha ha ha ! Being an avid ex-MMORPG player I do understand the foundations of the complaint. It’s funny since it’s just a game, but when you spend 5, 6, 9+ hours a day playing it, you start to care about inflation, supply & demand and things related that really apply to the game.